The Society Garlic Herb is in the onion family. 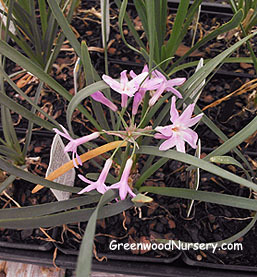 Tulbaghia violacea, Also, known by other names such as pink agapanthus and sweet garlic. Society Garlic grows like chives. Use the leaves in salads, soups, egg dishes, stir-fry dishes or any dish you want just a slight taste of garlic. Makes a great kitchen plant. Use the leaves of this outdoor or house plant. Aptly named, Society Garlic, as it was believed that you don't get bad breath from eating it. Society Garlic is adaptable to most soil types but should be well-drained. Plant in full sun, mulch with aged compost so it doesn't cover the crowns. Protect from strong wind and harsh winter weather. Fragrant lilac flowers appear in summer. Native to South Africa. Society Garlic ships in 3.5 inch pots. Plants shipping to CA or AZ will be root washed before being wrapped for packing.